Add greater range of movement to your LCD display or TV with the Neo-Flex Wall Mount Lift! CF proprietary lift-and-pivot motion technology adjusts with a light touch. Raise or lower your LCD 5". Pan right or left. Tilt forward or back. Even rotate 90° for portrait/landscape viewing.It is perfect for clinics, labs, manufacturing, airports and other space-constrained areas. 5" vertical adjustment enhances ergonomics for multiple users. Right/left pan and forward/back tilt minimize glare and increases viewing comfort. 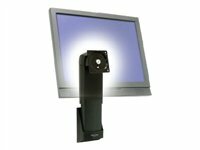 The lift works with a variety of Ergotron mounting systems.